The interior design of The Glen House is inspired by the Shakers. The Glen House, the new 68-room hotel being built at the base of Mt. Washington, is on track to open in mid-September. The hotel – the fifth Glen House hotel built in the location since 1952 – is owned by the Mt. Washington Summit Road Company and located near the base of the Mt. Washington Auto Road, which the family-owned company has operated since 1906. The Glen House was designed and is being built primarily by New Hampshire firms, including contractor Martini Northern of Portsmouth, BMA Architects & Planners of Amherst, interior design firm Stibler Associates of Bedford, Ray's Electric of Berlin, Granite State Plumbing and Heating of Weare, Yeaton Associates Inc. of Littleton and GB Carrier Corp of North Conway. BMA used clapboards and shakes on the exterior – Lap Siding and HardiePlank Shakes, made of fiber cement, with white trim in a style similar to its predecessors. Biggers said The Glen House is a high-performance building envelope, close to energy self-sufficient and carbon neutral, thanks to a geo-thermal system that will provide heating and cooling as well as two offsite energy-generating projects harnessing hydro and solar power. 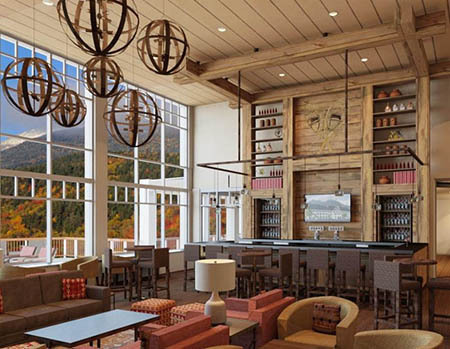 The interior design of the hotel draws upon the Shakers, the vintage woven baskets and artifacts of the local Abenaki Native Americans tribe and north woods culture, said Janet Harkins of Stibler Associates. “Shaker milk paint inspired the palette for the colors inside the hotel,” said Harkins. The hotel will be the fifth Glen House on the property. The first Glen House opened in 1852. It burned in 1884 but was rebuilt on an even grander scale, including the longest veranda in the world. The second hotel lasted only eight years before fire struck again. Two subsequent smaller Glen Houses served guests in winter and summer into the 1960s.